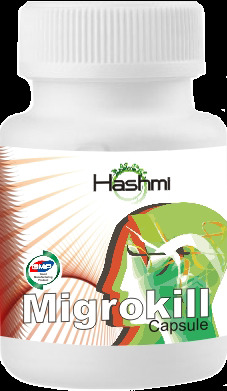 Hashmi Migrokill is a natural Product for migraine. It has been created using a combination of all natural herbal extracts which provide soon relief from headache and nausea feeling. It also controls other symptoms associated with migraine. It is a clinically proven dietary supplement which has been created after taking references from centuries old Unani text. Hashmi Migrokill deploys Triple Therapy approach combining three dietary supplements which work to give relief from migraine headaches and other symptoms associated with it. It dilates blood vessels which leads to improved circulation and helps you lead a normal life. It is all natural with no side effects. It is very effective in migraine and is known to reduce its duration and intensity. It comprises of active ingredients such as Withania Somnifera, Glycyrrhiza glabra, Acorus Calamus and Centella which solves it in an effective and safe manner. It is an excellent natural alternative to OTC medicines available. Hashmi Migrokill capsules need to be taken twice daily to relieve its symptoms. It has also been found effective in chronic migraine within a short span of time. Hashmi Migrokill has enabled millions of patients to lead a normal life in a natural way without any kind of side effects.